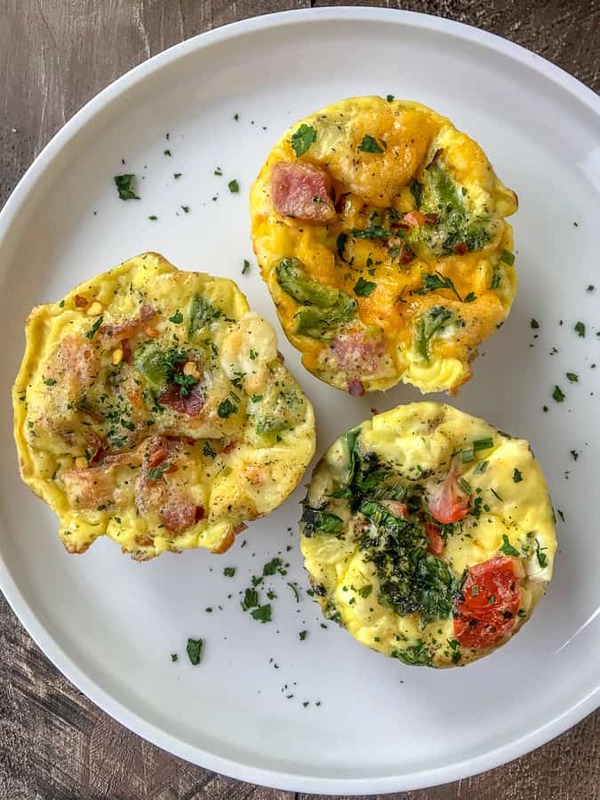 These Make Ahead Egg Muffins are a great, tasty breakfast option that simplifies the traditional frittata! Three different combinations made with an array of vegetables, cheeses and meats that are low in carbs, high in protein, and Keto-friendly! These are perfect for meal prepping, for busy lifestyles where you need to grab-n-go, or as a post-workout snack. If you’re someone that can have breakfast food any time of the day, then you’re my kind of person! We are major breakfast people in this household and can have it any time of the day. One of my favorite things to whip up is a Ham and Broccoli Hash Brown Crusted Quiche. It’s filled with delicious ham, vegetables, and cheeses on a crispy hash brown crust. Making for the ultimate, filling breakfast meal. My husband gobbles it up with a side of taste (and ketchup – silly man). So if you’re a quiche lover or a frittata fan, then this is the recipe for you! It is actually three recipes in one starting with the base egg recipe and adding in just the right amount of your favorite ingredients. Three ingredient recipe of spinach, tomato and goat cheese. If you’re not a fan of goat cheese, substitute with feta cheese or the cheese of your choice. This recipe, as is, tastes great with a tiny drizzle of balsamic glaze. Yum! Another 3 ingredient version. Be sure to use cooked broccoli and ham. You can swap the ham for bacon or prosciutto! Cooked bacon, bell peppers, and pepper jack cheese. One of my favorites as I am a huge fan of pepper jack cheese and bacon together. Don’t forget to garnish with some parsley for a little extra flavor! 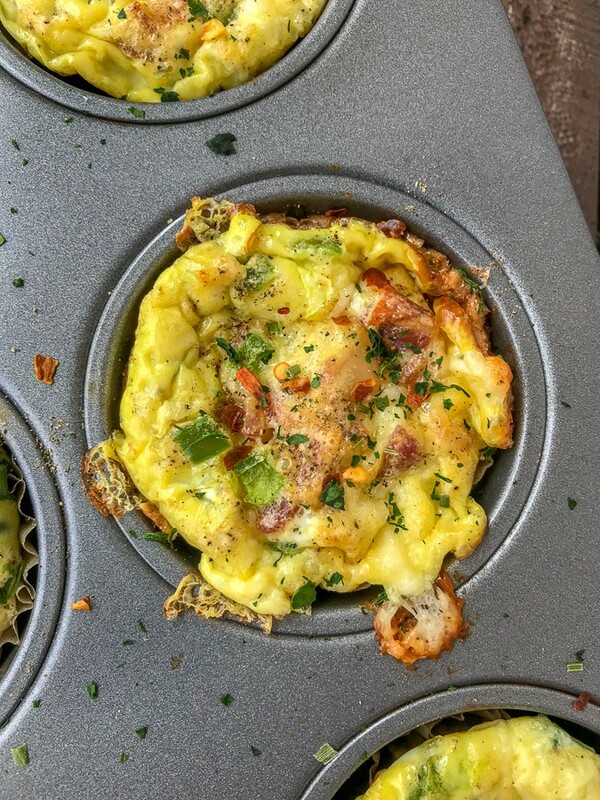 These Make Ahead Egg Muffins come together easily and quickly! 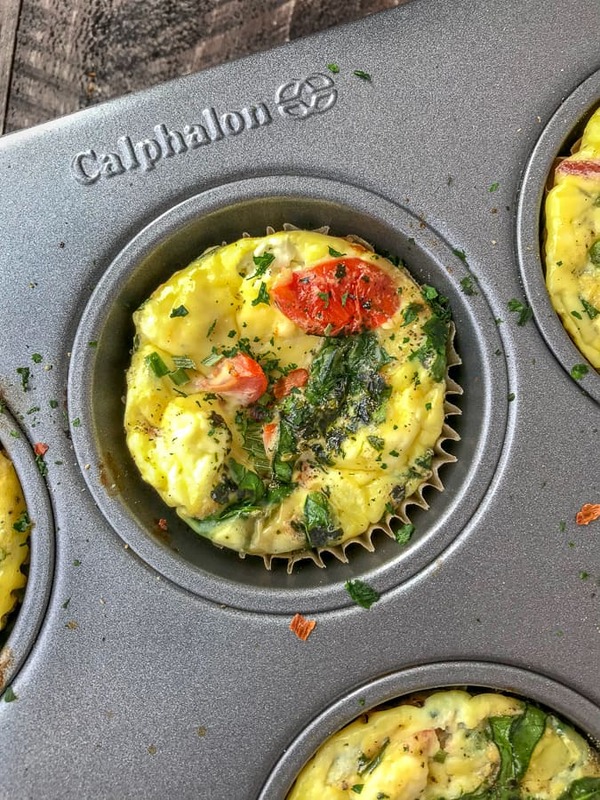 All you need is a 12-Cup Muffin Pan, a mixing bowl, and cutting board with knife. 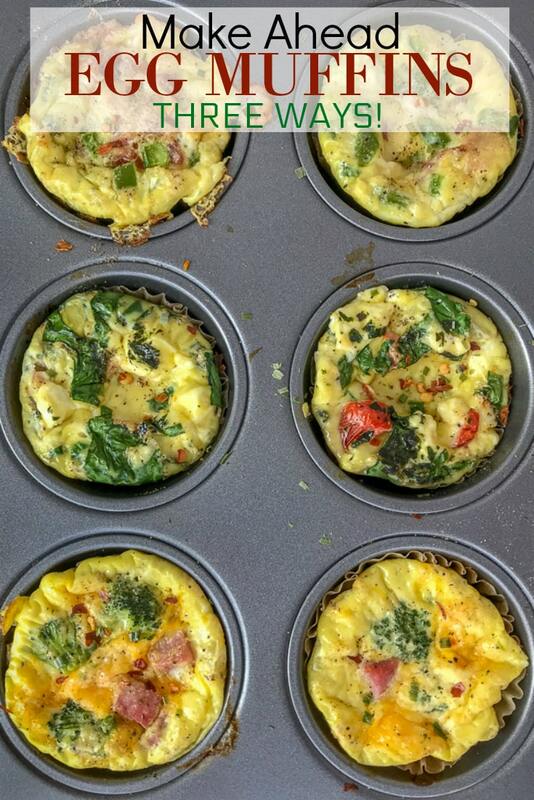 Be sure to either spray the muffin pan with non-stick cooking spray or use parchment liners to keep the egg muffins from sticking. 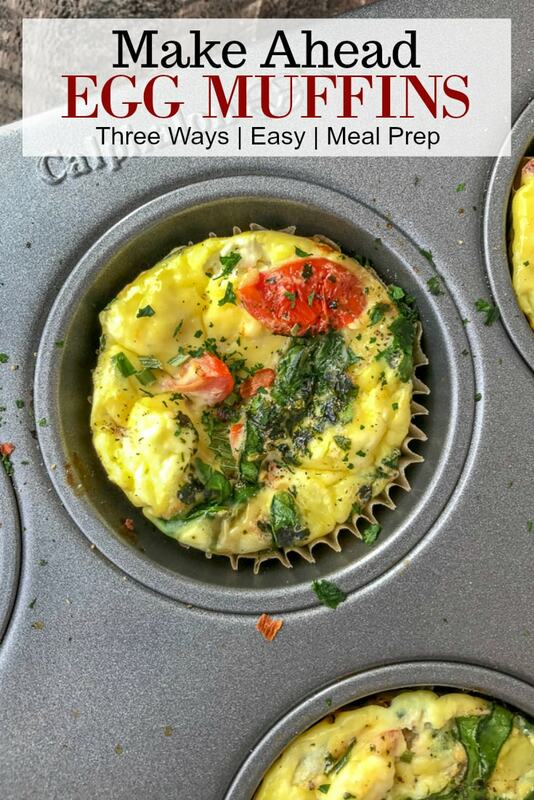 Linked are my favorite ones to use with any baking that I do using my muffin pan. They will fall off of these muffins rather than stick – which is essential! They work splendidly to keep oil-free muffins like my Chocolate Chip Banana Yogurt Muffins from sticking. Add the main ingredients to the muffin pan first before pouring in the egg mixture. You don’t want to overflow the muffin wells, as they will rise a bit while baking. Fill each well 3/4 of the way full. Garnish with salt, pepper, and parsley (optional). Remove and serve with salsa, greek yogurt, Sriracha, diced avocado, or your favorite breakfast condiment! 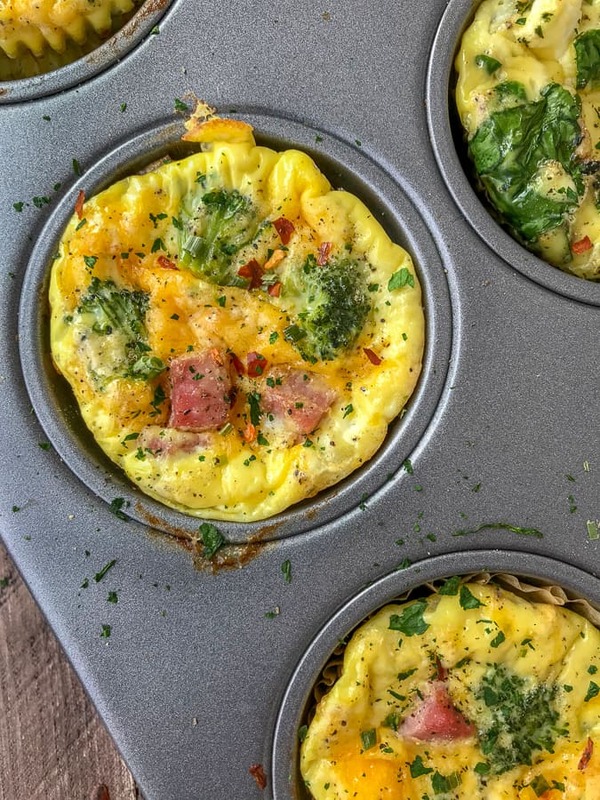 Grease the pan thoroughly or use parchment liners – otherwise the egg muffins will stick. Don’t over-fill the wells. The eggs will rise as they bake. Fill each well 3/4 of the way full. This includes the add-ins. Refrigerate any leftovers in an airtight container for 3-4 days. You can rewarm them in the microwave for 10-15 seconds or in the oven at 350 degrees F for 5-10 minutes. Freezing: Allow the muffins to completely cool before putting them into a freezer-safe bag or container. I find they taste the best if eaten within 1 month. I find that it is easier to pour the egg mixture into each well using a large glass measuring cup. Add all of the eggs to the measuring cup, whisk to thoroughly combine, and pour! 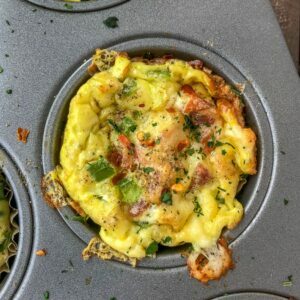 MORE EASY BREAKFAST RECIPES TO TRY! 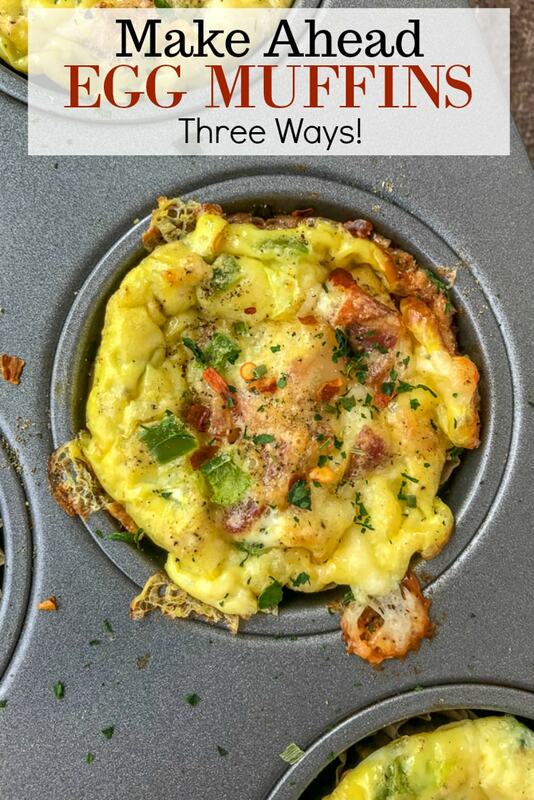 Three delicious ways to make egg muffins quickly and easily! Low-carb, high-protein, and filling. Great for meal prepping or grabbing on the go. Broccoli Ham and Cheddar, Spinach Tomato and Goat Cheese, Bacon Peppers and Pepperjack Cheese - YUM! 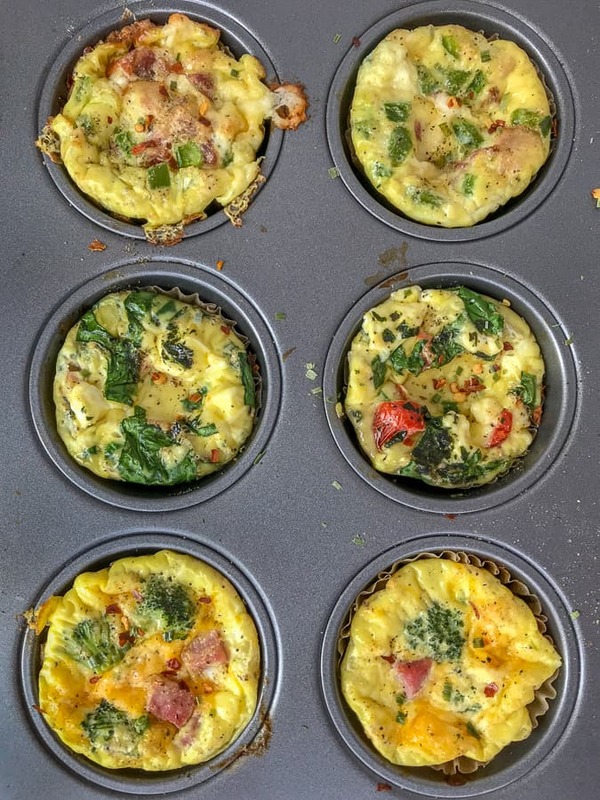 Preheat oven to 350 degrees F. Coat a 12-cup muffin pan with nonstick cooking spray or line with parchment liners. To a large 4-cup glass measuring cup, or large mixing bowl, combine the eggs, onion, and seasonings. Whisk to thoroughly combine. To each prepared muffin well, add the ingredients for each combination - 4 per combination. Pour in the egg mixture to fill each well 3/4 of the way full. Serve warm, garnished with chives, freshly chopped parsley, and your favorite breakfast condiment.